Late the other night, I thought I heard the crunch of leaves underfoot in the garden. When security light came on, I was seriously concerned that we might have a burglar prowling around the house. When I steeled myself to look out the window, I couldn’t see anything. And then I noticed a tuft of grass weaving rather vigourously and a loud slurping and chomping noise, as if somebody was eating very enthusiastically with their mouth open. I was pretty sure that this wasn’t a burglar, or at least it would be one that was no taller than about 4 inches (so he really wouldn’t be a problem), so I went out to investigate. 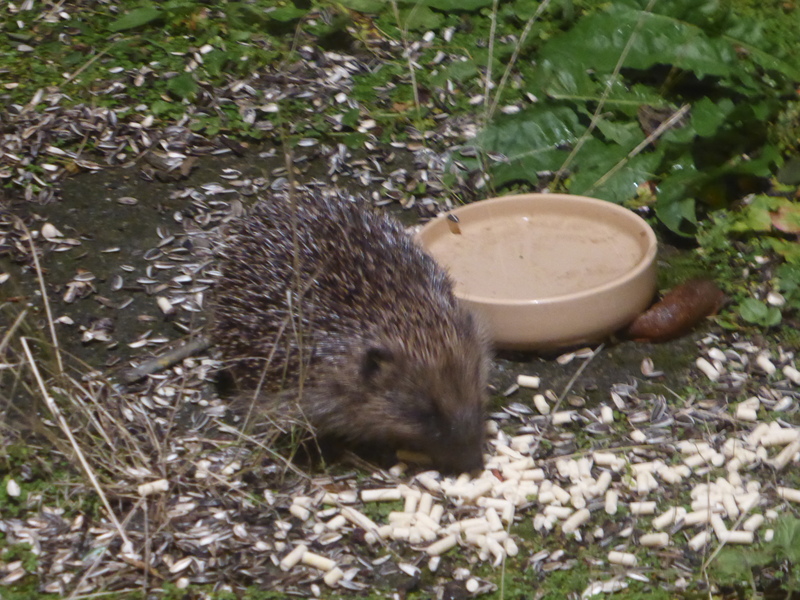 I have found the hedgehogs happily chomping on the leftover bird food that’s fallen from the bird table. They seem to particularly enjoy sunflower seeds and any leftover suet pellets that the birds have tossed aside. This little chap seemed so excited by the bird food that he started chirping. Who knew they chirped? How cute. I have absolutely loved our prickly new visitors to the garden, and I really hope they stick around. Absolutely gorgeous..I remember them in our garden in Wales but now living in Australia I miss them and ‘robbin red breasts’. Lovely post.